After suffering through the most severe bleaching event ever recorded last year, the Great Barrier Reef is once again being savaged by a marine heat wave. After just one day of aerial surveys, the Great Barrier Reef Marine Park Authority, which oversees the region, has already confirmed that warm waters are causing another mass bleaching. Climate change is compounding the reef’s woes as warming waters put corals in a precarious position to survive. 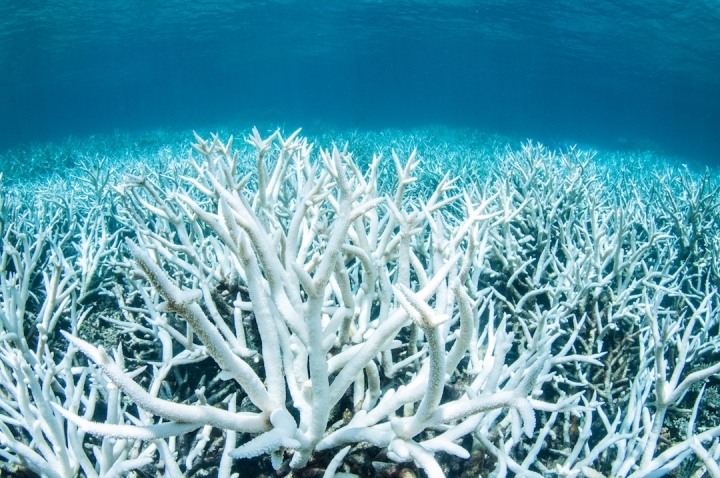 Bleached coral skeletons in the Great Barrier Reef near Port Douglas photographed on Feb. 20. 2017. Scientists surveyed a 200-mile stretch of the northern end of the reef earlier this week. The full extent of the bleaching will take weeks to tease out as the reef covers an area roughly the size of Germany. But the early returns are bad news for one of the world’s natural wonders. The region was home to some of the worst bleaching last year and coral have been weakened by months on end of continued heat. Waters in the region have rapidly warmed over the past two months and are currently up to 5.4°F above normal. Greenpeace has also been documenting the reef’s plight starting on the northern end. Its underwater surveys have revealed equally disturbing images of a reef in distress. Bleaching happens when waters get too warm for the algae that live inside coral. The heat causes them to die off or be expelled, leaving behind ghostly white coral skeletons. It’s that process that hit 93 percent of the Great Barrier Reef last year, causing nearly a quarter of the coral to die off. For scientists who have studied the reef for years, that development brought them to tears because it foretold what the future holds for the reef unless carbon pollution is cut. If oceans warm 2.7°F, it will essentially be a death sentence for most coral. Last year’s bleaching event shows climate change is taking its toll. Scientists working with the World Weather Attribution team revealed that climate change made the warm waters that caused the bleaching last year up to 175 times more likely. The Great Barrier Reef bleaching was the most widely publicized aspect of a global coral bleaching event that spread to every ocean basin for three years and counting. Bleaching warnings and alerts over the past 90 days. Losing one of the most amazing features on the planet is in and of itself a disturbing prospect, but it’s also a dollars and cents issue. The Marine Park Authority estimates that the reef supports roughly 70,000 jobs and generates $4.45 billion in tourism revenue each year. Reefs also provide protection from storm surge and for crucial fisheries around the globe. The beauty and economics are, in part, why scientists are racing to save reefs in the face of climate change. Their efforts include trying to understand why some corals survive in warm water in hopes of breeding them or sharing their secrets with other corals. “We can’t afford to sit by and watch climate change drive all the world’s coral reefs to extinctions by the end of the century,” Julia Baum, a reef researcher at the University of Victoria, told Climate Central last year. For Baum and other scientists, it really is a race against a competitor that shows no signs of slowing down. Three years in a row of record-setting heat around the globe have changed the equation for corals. “The tropical oceans have absorbed so much heat from record temperatures in 2014, 2015, and 2016 that the baseline for temperatures has gone up,” Eakin said.